Well that’s my third race of the 2017 season ticked off and phew, what a scorcher! Prior to the race I outlined my pre-race objectives as usual, and I am pleased to say that I managed to knock them all out of the park, finishing in joint 13th place in a time of 11:13. Right well that is the high level race summary out of the way, lets get into the detail. My taper was short but went well and as Friday morning arrived I was pleased to feel some bounce return to my legs. I was ready to run and was looking forward to the race. I had also been lucky enough to see a consultant about my ongoing abdominal injury on the Thursday before the race. My biomechanics were checked with positive feedback and I was given the green light to race, all be it with a warning that I should be sensible about the injury and stop if it really hurt. An MRI was also booked for the Tuesday after the race, with the idea that the injury would be nicely aggravated after fifty hilly miles and therefore easier to diagnose. Oh joy! After work on Friday I hit the A1 and headed north towards Andy and Rachel’s, who had kindly offered me a bed for the night. Andy was running as well the next day, however my arrival would be too late to register at Malham the night before, so instead we settled for a sociable evening catching up over a beer and getting to bed at a reasonable hour. I laid out all my kit ready and also applied some precautionary zinc tape to both heels to save time in the morning. One of the key aims of the race was to test my kit ahead of the Lakeland 100. I planned to race in my Inov-8 Race Ultra’s for a change also use tape to try and provide some additional protection to my lower heels, which had blistered during Lakeland last year. A final quick read of all the good luck posts I had kindly received on Facebook and Twitter and I rolled over to try and get some sleep. An early alarm call is never nice but 03:30 is especially painful, but necessary when a race is scheduled to start of 06:00. Kit was quickly pulled on, feet lubed and a good layer of sunscreen applied before I headed downstairs to join Andy for a quick breakfast of porridge and coffee. There was a slight nervous energy in the air with the dawn light as we jumped in the car and hit the road to Malham, careful to avoid a couple of late night revellers weaving around in the street. It was a beautiful drive across under overcast skies. The weather forecast was looking fairly accurate, with low cloud predicted to lift by lunchtime, with clear blue skies and warm temperatures expected in the afternoon. I was really looking forward to seeing Malham in daylight, after previously being there during the hours of darkness back in January on The Spine Challenger. As we arrived at the village, all was quiet and Malham Cove could be seen in the distance. First order of business was to do the first of many loo stops and then get registered. Would we regret not registering the night before? Athletes were milling around and sorting kit in their cars and we exchanged greetings as we walked into the village, where the large GB Ultras gantry greeted us beside The Buck Inn. We were directed to the village hall and moments later were leaving, with kit check complete and race numbers securely in our hands. This had to go down as one of the slickest and hassle free race registrations ever! Back at the car we sorted out final bits of kit and got ourselves geared up for the start. As we were getting ready to leave my running mate from The Spine, Richard Martin pulled alongside us in his car. His original plans to run had been scuppered by a foot injury but he had come along anyway to assist with the race and it was great to see him. Andrew and Giles before the start. Blissfully unaware of the pain and heat to come! With twenty five minutes to go we locked the car and walked the few hundred metres to the race start, in preparation for the race briefing. We met and chatted with the race director Wayne Drinkwater who checked we had everything we needed. Other familiar faces were there for us both and we chatted with other runners while we waited, the low hum of conversation filling the air around us. It was a lovely relaxed environment and I have never felt so chilled before a race. I took the opportunity to do some final stretches and mobilisation work on my abdomen and hips until Wayne called us forward for the race briefing. This was a short affair and we were soon into the final five minutes. A quick final visit to the little boys room and we were corralled under the starting gantry and were off! We ran out onto the street and turned left through the village, quickly joining the path up towards Malham Cove. It was a cool but dry morning and I heeded my doctors warnings and let my body ease into the run. Ahead we could see the leaders already pulling away from the rest of us but this was not a day for racing, at least not for me anyway. Today was all about testing my body and fitness to see whether Lakeland 100 was still possible. Boy I hoped that would be the case! 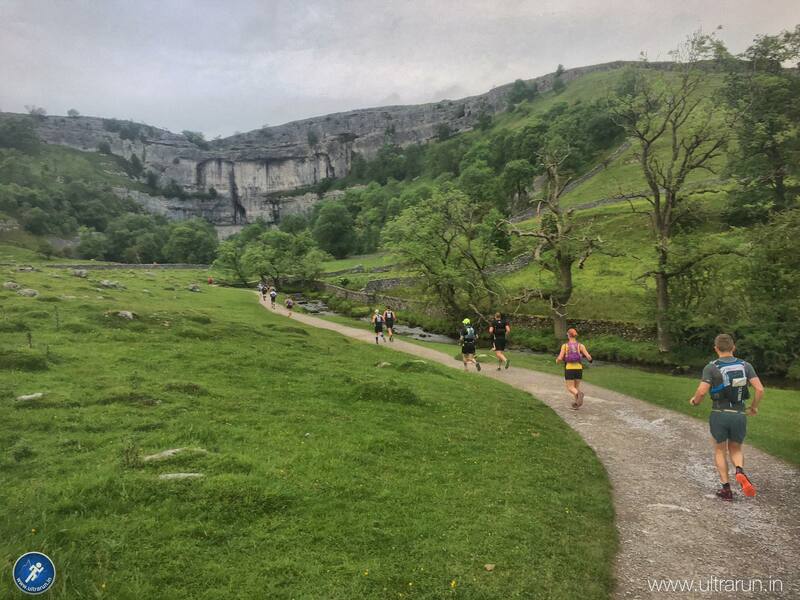 As we entered Malham Cove I kept stopping to grab some photos of the scenery and runners around us. 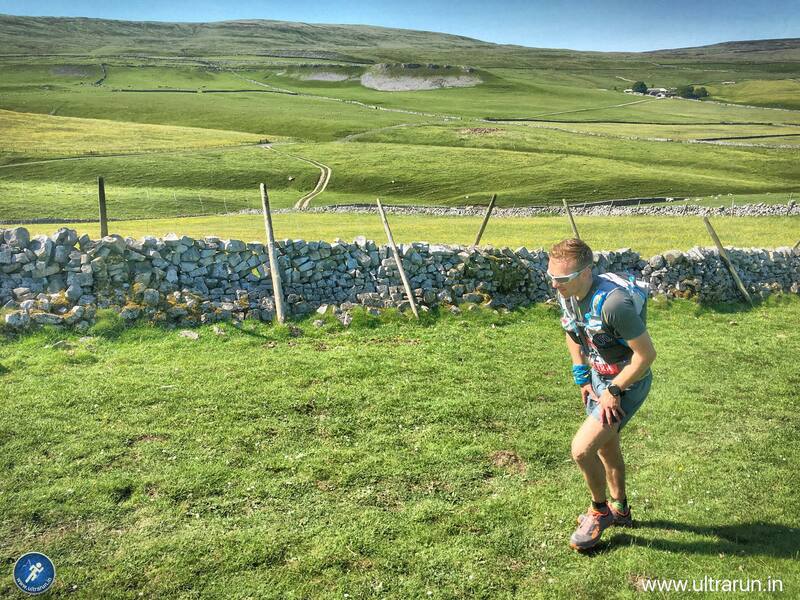 Andy pulled ahead of me and I would run to catch-up but with repeated stops I eventually slotted into the group around a hundred metres behind him, confident I would catch him once the ground opened up around Malham Tarn. We hit the steep steps up the side of the Cove and we all dropped to a walk, smiling for the supporters waiting for us and taking photos as we climbed. In short order we had reached the rim and headed right across the famous limestone pavement on top, following the Pennine Way towards the first of our Yorkshire Three Peaks, Pen-y-Ghent, some ten miles away. Some open ground behind the Cove allowed for the group to spread out but we soon came back together as it narrowed past Ing Scar and we climbed again up towards Malham Tarn. Ahead the front of our group bore left away from The Tarn. This felt wrong and some quick checks showed they were indeed drifting and we called them back. We rejoined the path and Malham Tarn eventually appeared before us under the grey skies. Andy and I were back together now and chatting as we ran. It was a comfortable pace but as always my stomach felt tight, so as we rounded the Tarn through the Education Centre I stopped briefly to stretch my stomach out, getting some weird looks from runners as they passed. We ran downhill away from the centre and I thought back to the last time I was here in the dark, when we had missed the turn right and added a couple of unwanted extra kilometres to our route. Easily spotting the signpost in daylight, we left the road and headed up towards our first hill of the day, Fountains Fell. My memories of this climb from The Spine Challenger were pretty good and I knew this would be quite a drag, more so than Pen-y-Ghent which is a short sharp climb in comparison. As we ran we fell in with Stephen Duckett, who was running the hundred mile event, meaning that on his return to Malham he would set out for a second lap. Stephen would eventually go on to finish third in his race. Congratulations Stephen, a great effort! 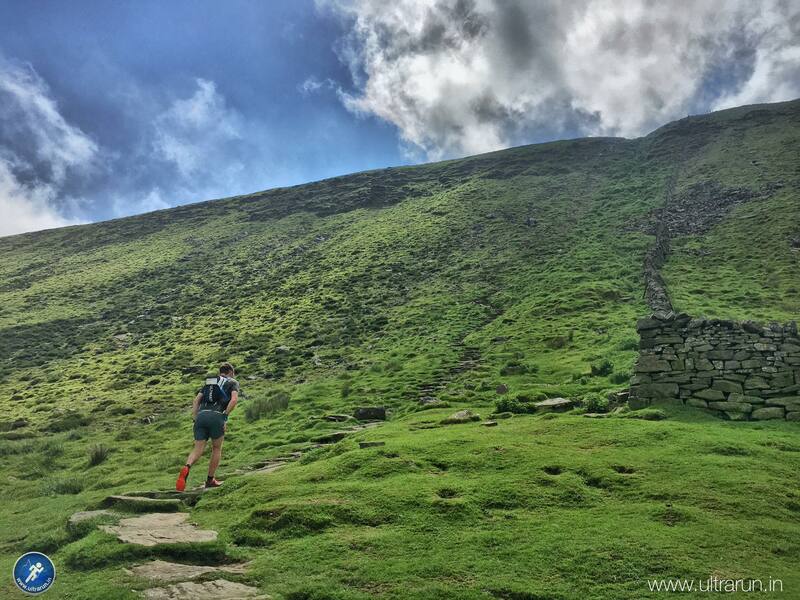 We talked about running and football and before we knew it were soon getting stuck into the climb straight up the fell side by Tennant Gill, before bearing north for a more gradual climb around the flank of Fountains Fell. The field had become quite stretched out by now but we guesstimated we were fairly near the front, in the top twenty at least. As we climbed the cloud grew thicker and eventually we were running through the hill fog and light drizzle in places. Fortunately it was warm enough that jackets were not required and we also knew that this would be short lived, as soon the path would turn westwards and begins its descent towards Silverdale. It became increasingly difficult to see through my glasses as the mist and rain grew stronger, eventually reaching the point where I could see more clearly without them on. What is it about Fountains Fell? Four months earlier I had had exactly the same dilema. I finally gave in and removed my glasses as we turned and began our descent down the track towards the valley. Having stopped to take more photos Andy had disappeared ahead of me into the mist but after a quick check of the route on my watch I was comfortable we were heading in the right direction, so disconnected my brain and flew down the fell side behind him. Down we ran through the mist, weaving past runners and making up ground. As the cloud cleared I could see Andy about a hundred metres ahead of me and as we reached the road we re-grouped for the short run to the first checkpoint. My stomach was tight but my legs felt good and our spirits were pretty high as we arrived at the first checkpoint, with 16 kilometres ticked off in 1:53. Bottles topped up, some savoury food grabbed and we were quickly on our way. I was following the same nutritional plan I was aiming to use at Lakeland, namely carrying 500ml of Mountain Fuel and 500ml of Nuun between each checkpoint. In my running vest I also carried a couple of Nakd Bars, a Stoats Oats bar and packet of Shotbloks, planning to use the checkpoints for the majority of additional nutrition. I was kicking myself as I had meant to add a small bag of salted peanuts too but I forgot to in the pre-race rush. I hoped I would not come to regret this oversight later in the day. We immediately hit the Pennine Way junction away from the road and towards Pen-y-Ghent and I looked around in surprise. I had assumed we were further away from this junction back up the road, as during the Spine we had slept for a couple of hours at this very location. In the darkness I had somehow assumed we were near a farm but looking around there wasn’t a building anywhere near us. It was so strange to see somewhere which seem so familiar but also so different to how I’d envisaged it back in January. 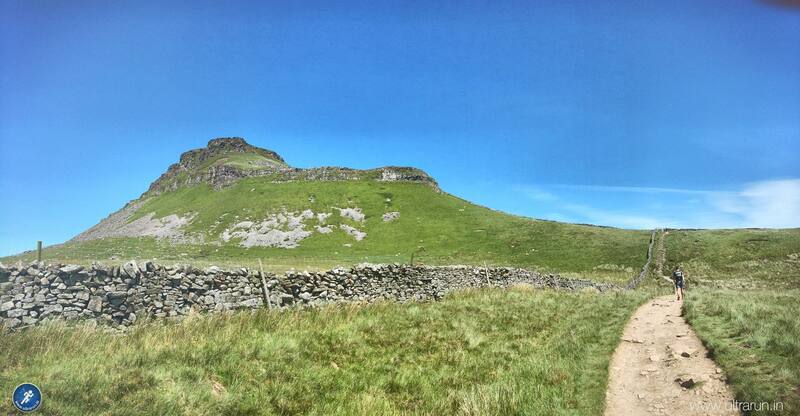 During the Spine it had only taken us forty minutes to walk from the road to the summit of Pen-y-Ghent, so today I was confident we could do this in closer to thirty – in fact we did it in around 25 minutes. As we climbed we chatted and soon we entered the cloud once again. Shortly before the first steep rocky section about two thirds of the way up we were suddenly surrounded by people. A virtual procession of people was climbing over the wall to our left and joining the path before us. What had been a peaceful morning run, now felt more like Piccadilly Circus as we weaved our way through the crowds, slowing moving upwards or standing in groups chatting. If we needed confirmation we were now on the official Three Peaks route, here it was. All around us were walkers setting out on their own adventure from Horton in the valley below us. We moved as quickly as we could through them, looking for new lines up the rocky steps and politely passing where the path or surrounding fell allowed. There was a real sense of urgency and desire not to be held up and I knew at this point I was pushing myself harder than I would have under normal circumstances. Would I pay for this later? Once the second rock section was negotiated we hit the easy angled slabbed path up towards the summit shelter and gently jogged towards it. A quick tab of the trig point and we turned and headed down, keen to try and get ahead of the crowds. The wind had increased significantly and once again my glasses were all but useless in the mist, so I removed these and my visor for safe keeping as the path tipped downwards. Freshly laid slabs stretched out before us and we flew down these, weaving past walkers as we went. After a number of near collisions it soon became apparent that it was easier to run straight by than shout a warning, as a cry of “excuse me, coming through on the right” would invariably end up with the walker stepping right into your path. Without my glasses it was difficult to get any depth perception as we ran, especially with the slabs a uniformed shade of light grey. It was a little heart in mouth at times but I once again disconnected my head and together Andy and I flew down the fell side. Down we went, eventually clearing the cloud and looking for the junction off the Pennine Way and onto the Three Peaks Trail. This duly arrived and we left The Pennine Way to continue on our loop across Wernside and Ingleborough, before (all being well) returning to Pen-y-Ghent and the Pennine Way later in the day and heading back to Malham. With the cloud now well above us I was able to clean my glasses and restore my vision once again. 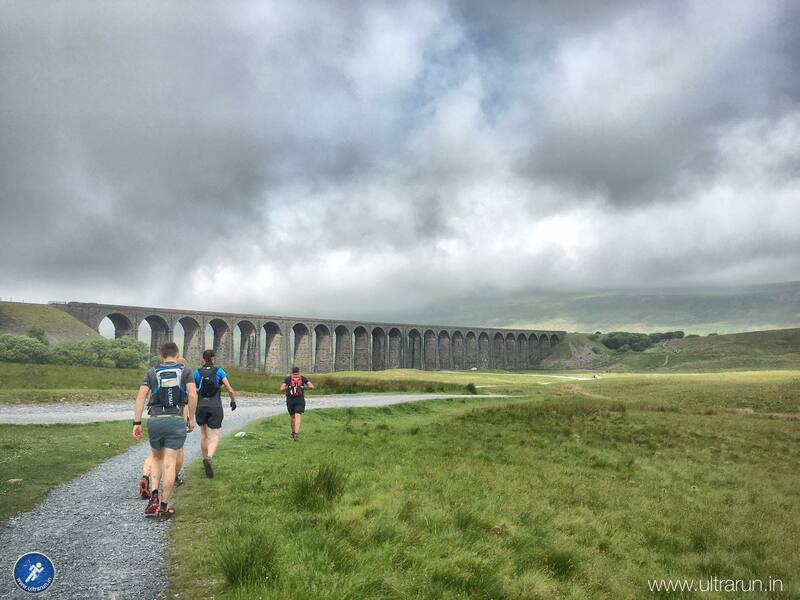 Before us lay over ten kilometres of rolling terrain before checkpoint two just before the Ribblehead Viaduct. On we ran, passing a handful of runners and many walkers as we went. As we passed through the twenty five kilometre mark the first signs of fatigue began to appear in my legs. Andy and I joked how I always say I need to get to forty kilometres before I really felt in the zone. I hoped that this would be the case today too and that I wasn’t about to pay the price for my earlier enthusiasm. We eventually met the railway and climbed up Hunters Hill to join the Gauber Road for the final mile or so towards the checkpoint. My left hamstring was starting to twinge and I stopped to quickly stretch it out, hopeful that this was just my body settling into the race and nothing more serious. As we rounded the corner the Ribblehead Viaduct came into view and the checkpoint appeared at the roadside. To the clanging of cow bells and applause we ran in. 30.5 kilometres ticked off in total and 3:38 on the clock. We were moving well but could we keep this pace up? As we left the checkpoint the cloud was starting to burn off, with the exception of our next destination, Whernside, whose summit remained stubbornly hidden from view. I took the opportunity for another quick stretch before we left and soon we were running alongside the viaduct. As the path kicked up at the far end I could see Richard Martin sitting with his camera ready. No excuses now, we would have to run up the steps! After a brief chat with Richard we moved on. I was amazed at how many walkers were still around us, including families with some quite young children, who seemed to be enjoying the challenge. Good on them! I had grabbed some savoury food at the checkpoint and re-loaded my water bottles but was now starting to worry about whether I had brought enough food with me. I had already eaten my Nakd bars and was into my Stoats bar too, leaving me just one final bar to see me to the end. Maybe my plan to go lightweight with fuel wasn’t working so well after all? My legs were also feeling really tired and as we started our climb up onto the shoulder of Whernside, I realised I was paying the price for pushing it too hard earlier on. On a positive note, the ache from my legs was drowning out the pain from my abdomen and for the first time in long while, I was running without any ab pain. That was until I would stumble on a rock, at which point it would give me a nice stab just to remind me it was there. Despite the discomfort, we were still running well on the flats, which was reassuring. The climb onto Whernside is a real tease as you can see your destination off in the distance but are forced to loop around it before making your final climb to the summit. 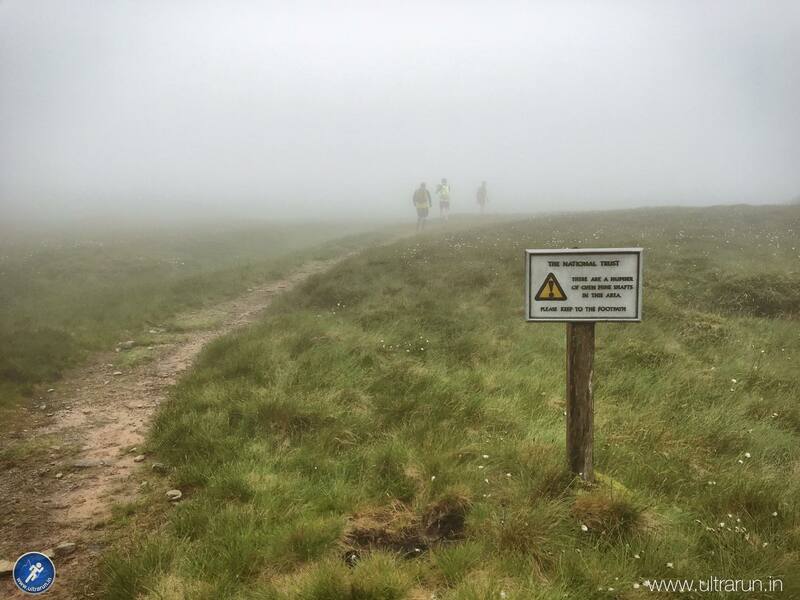 As we approached the final few hundred metres we entered the cloud once again, which was a pleasant relief from the hot sunshine burning down on the lower slopes. We had both left the checkpoint with a litre of water each and the heat and effort already meant that we had both consumed at least half of this as we reached the summit shelter. Andy pushed on but I quickly popped through the wall to tag the trig point. A quick check of the watch showed that it was 10:40 and we had already ticked of 3 of our 5.5 summits (the return to the shoulder of Pen-y-Ghent making the 0.5) and at 37 kilometres, were nearly half way in distance. Things were looking good and at this rate we were on for a time well under twelve hours, and even had a chance of going sub eleven. Down we ran through the cloud along the ridge to the path junction to the valley floor. On gentle descents I could really open my legs and run well but as the gradient became more steep I could feel my quads starting to grumble. My lack of hill work this year was showing. This was a real dilemma. Do I relax, let gravity take hold and fly down as quickly as possible? Or do I hold back and prolong the load? I opted for a more conservative approach, conscious of the climbing yet to come, and slowly Andy pulled away from me as he flew down the fell side. We were back in the sunshine now and it was a slowish and somewhat painful descent for me towards the valley floor. The path was considerably quieter at this point and we only passed a handful of people as we approached the gate and tarmac road beyond through the campsite up to the main road. It was hot work and Andy and I regrouped just before the campsite and shared our concerns about the lack of water. 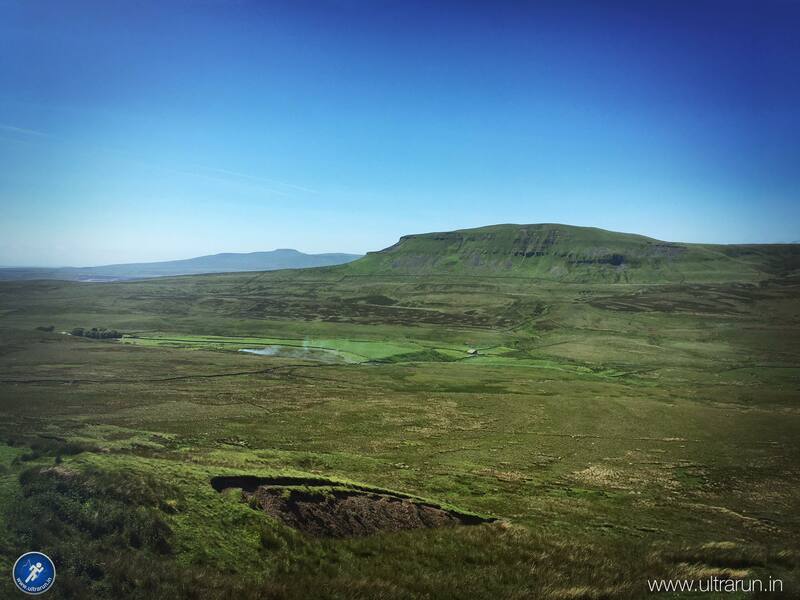 Before us lay the steep ascent of Ingleborough, with an out and back along the summit ridge to make up the mileage. Only after this could we start our descent towards Horton and the waiting checkpoint just above the village. Put simply, the temperature was rising, it was a long way to the next checkpoint and we both had little water left to see us there. As we rounded the corner we saw a sign advertising pints of squash with ice at the campsite for £1.30. Andy suggested we ask if they would fill our bottles for us, to which I responded “stuff that, I’m buying us iced squash!”. It was wasted time but it was worth the stop, and we desperately needed the fluid. Besides it’s not every day you get to say you stopped half way around a fifty mile ultra marathon for a pint! Five minutes or so later we were heading on our way, with 500ml of fluid each. I was carrying a large lump of ice which I was eating and placing on my neck to cool me down between mouthfuls. Ice had never tasted or felt so good. As we crossed the main road we could see the cloud slowly lifting from the summit ahead of us. It was still some distance away but we both knew what awaited us. Yorkshire’s own wall in the north! For those that like Game of Thrones you will hopefully get the reference. The ascent to Ingleborough starts fairly sedately with some quite runnable sections before rolling gently upwards. There is a nasty sting in the tail though and as you approach the hill, the final section kicks steeply upwards for a painful final climb up onto the ridge. From here our work was not done, as we were required to run a mile down along the ridge away from the summit to pick up a card, only to return and head to the summit proper, which includes another short sharp climb before an easy run along the summit plateau. There was no avoiding it and in the baking sun we got our heads down and got stuck into the climb. Up we strode, making good pace, stopping for the occasional photo, only so we could share the view with those at home of course! Director Wayne Drinkwater waiting to give congratulations and also take our photos. Despite the pain from the hot climb I even managed a smile and we stopped briefly to chat with Wayne before heading out down the ridge to collect our card. The out and back gave us a chance to see who was in front and who was behind us. As we ran out we passed four other runners on their way back, sharing best wishing and spurring each other on. On our return leg we passed at least six others, including a couple of hundred mile runners who were setting a great pace in the heat. All in all I estimated there must be close to fifteen of us spread across the three miles on the summit of Ingleborough, it was a close race! As we started our final climb I noticed I had very little water left and joked with Andy about whether I should have it now or save it for the summit. He suggested the latter, although I wished I hadn’t listened, as there was barely a mouthful left and it was quite a disappointment when it came. A short run along across the windy summit plateau and we reached Ingleborough, our final Yorkshire Three Peak. No time to celebrate though, as we needed water desperately, so we turned and headed back along the plateau to find the path down. We were still making great progress but before us we could see the work that remained to be done, with Pen-y-Ghent off in the far distance and Fountains Fell beyond it. The path junction arrived and we veered off the eastwards towards Horton-in-Ribblesdale some seven or so kilometres away in the valley below. Somewhere between here and there would be the checkpoint, although it was unclear exactly how far away it would be, as the location had been a little vague in the race notes. 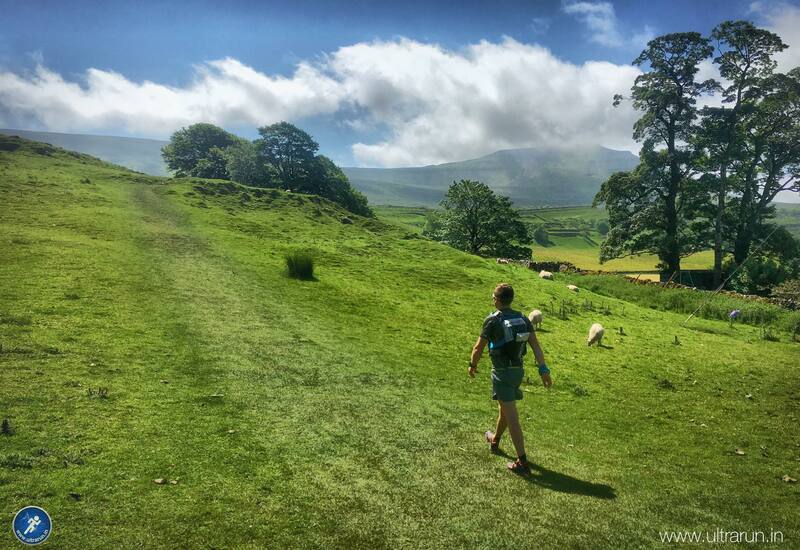 Andrew running towards our next peak, Pen-y-ghent … again!! The path was pretty runnable, although the steeper sections really hurt my quads and I was starting to feel my lower left quad getting really tight. We passed some walkers but I couldn’t see any runners ahead or behind us, despite our close proximity earlier on. On and on we ran in the afternoon sun, pounding our way down, hoping the checkpoint would appear before us. I was now extremely thirsty and all I could think about was cool clean water, I was starting to get pretty dehydrated! We rounded a corner and could see the path stretching away into the far distance with no sight of the checkpoint. My energy levels were dropping fast and I knew this was getting serious. Only one thing for it I thought, time to hit the Shotbloks and hope they will carry me to the checkpoint. I reached around to unzip the back pocket on my vest and grabbed the Shotbloks I had stowed there just in case. Andy then gave a shout of joy and pointed down below him. We hadn’t noticed a short drop in the path a few hundred metres ahead of us and nestled below it, out of sight, was the checkpoint. Hurrah we’d made it and with 7:15 on the clock and 53.5 kilometres ran we stumbled into the tent. “Where the hell have you been?”, was the good natured greeting we received on our arrival. “Right, what can I get you?”. “Water!”, we both replied and we each had one of our flasks refilled. Now I can drink quickly when I want to but even I was surprised by how quickly I drained the flask. I put the flask to my mouth, squeezed the sides and sent 500ml of water straight down my throat. Water had never tasted so good! “Anything else?” we were asked. “Yes more water please” I said, passing my flask back. As I did, I saw how little water they had in their jerry can. There was no vehicle in sight and they had obviously carried everything to this location, a feat of endurance in its own right. With so many runners behind us it was obvious that we were not going to get much more water and the alarm bells started ringing once again. The checkpoint staff kindly provided us with a few hundred millilitres extra and obviously seeing the concerned look on my face, reassured us that water could be gained at the public toilets in Horton a couple of miles away. I grabbed some orange segments and a packet of ready salted crisps and we headed on our way. As we were leaving another runner arrived behind us and we briefly exchanged pleasantries before pushing on. Little did we know that he would be the final runner we would see before the finish back in Malham. Andy and I walked for a while sharing the orange and a banana before picking up an easy run down through the meadows, over the railway line and into Horton. As promised a cold water tap was available outside of the toilets and I quickly drank a litre before refilling both my bottles. The final checkpoint was only a short distance away beyond Pen-y-Ghent but after the last few hours, I would rather carry too much water than not enough. Feeling slightly refreshed and more confident now we had water, we pushed on, navigating our way using the road book out of the village and back on to the fell side for the climb back to the shoulder of Pen-y-Ghent. As we climbed the heat started to get to Andy and he dropped back slightly. He was struggling to keep his heart rate down as the heat and climb took its toll. Little did I know that my time would come! Despite my legs feeling tight on the descents they were still happy to tick out the climbs. Mentally we were now on the homeward leg and once through the next checkpoint we just had to get back over Fountains Fell and it was downhill most of the way to the finish. With one last cheeky kick up in the gradient, we finally reached the wall and as the crowds of walkers had done many hours before, we climbed over and re-joined the Pennine Way. In the distance we could see the checkpoint, with Fountains Fell beyond. The climb now over, my quads started to grumble about the descent and Andy was able to slowly pull away ahead of me as I stopped to grab a photo or two. As the gradient eased back my legs were happier and I was able to catch Andy just before the checkpoint and we ran in together. 62 kilometres completed, with 8:40 on the clock. Almost home! As we had approached the checkpoint I had noticed a small stone inside my right shoe, so planned to stop and sort that before we left. Still feeling the heat, Andy headed straight for a chair and I too broke rule number one of ultra running and took advantage of a chair to sort out my shoes. Despite the short distance from Horton we had both drained another litre of fluid, so had our flasks refilled while drinking more water and some coke. No rest for the wicked though and after grabbing some food, including more oranges and a banana we gave our thanks and headed off. We ran along the road, confident now that we could easily finish under twelve hours. Despite aiming for a sub thirteen hour finish in my pre-race objectives, we had both secretly hoped for something around twelve hours. The question now was how close to eleven could we get? The Pennine Way sign pointed back up the fell side and once again we were climbing, but this was the final significant hill in our fifty mile journey and there was a slightly renewed spring in our step as a result. Looking back from the shoulder of Fountains Fell we could see our afternoons run laid out behind us and no other runners in sight. Despite there being so many of us together on the summit of Ingleborough, I guessed the heat had slowed us all and we were now managing ourselves to the finish. Oh well today was not the day for a sprint finish anyway, although I secretly hoped we may catch someone in front, especially when a passing walker encouraged us on by saying “keep going, he is only just up there!”. Final climb back over Fountains Fell in the blazing sun this time, with Pen-y-ghent and Ingleborough in the distance. It was great to finally reach the summit and know that the bulk of our climbing was over. My joy was short lived however, as once we started to run downhill my lower left quad tightened once again. Not now! Overload and fatigue was obviously the issue, as stretching made no difference. Gentle slopes were fine but steeper ones made it increasingly worse. The only way I could manage it was by running until it was too painful to continue, then walking for a few minutes to let it ease back out. Even with this approach we made short work of the descent and were soon on the valley floor making our way on more runnable terrain back towards Malham Tarn. There were a number of cheeky uphill stretches which, while annoying, did allow a short walking break, which my quad very much appreciated. The trees around Malham Tarn finally appeared ahead and it was a massive relief to be able to get beneath them, for a brief respite from the sun. A sub-eleven hour finish was looking impossible now, with 6-7 kilometres still to go. Something around 11:10 was possible though, as long as we kept moving. We were both tired and walked through the shade to try and cool down before running along the road away from the education centre. Once past the tarn car park we ran the open ground and walked the steeper or rougher terrain to try and protect my legs and abs. It’s hot hot hot! Andrew climbing back towards Malham Tarn, with Fountains Fell now behind us. The top of Malham Cove eventually appeared, accompanied by crowds of people out enjoying the sun. 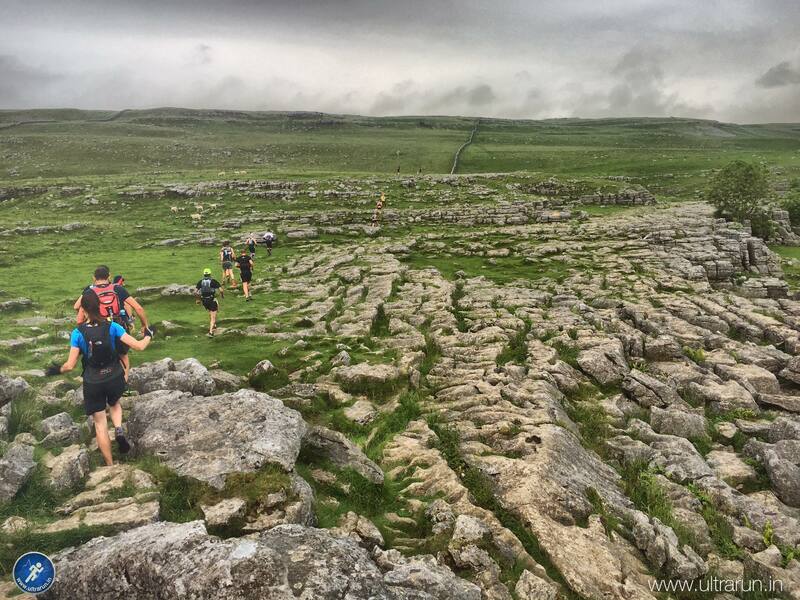 Unfortunately, rather than heading straight back down the Cove and taking the direct route back to the finish line, we were instead sent out further along the valley towards Gordale Bridge, before returning to Malham along the river bank and into the finish from the south. There were just a handful of kilometres to go but we were both ready to finish. 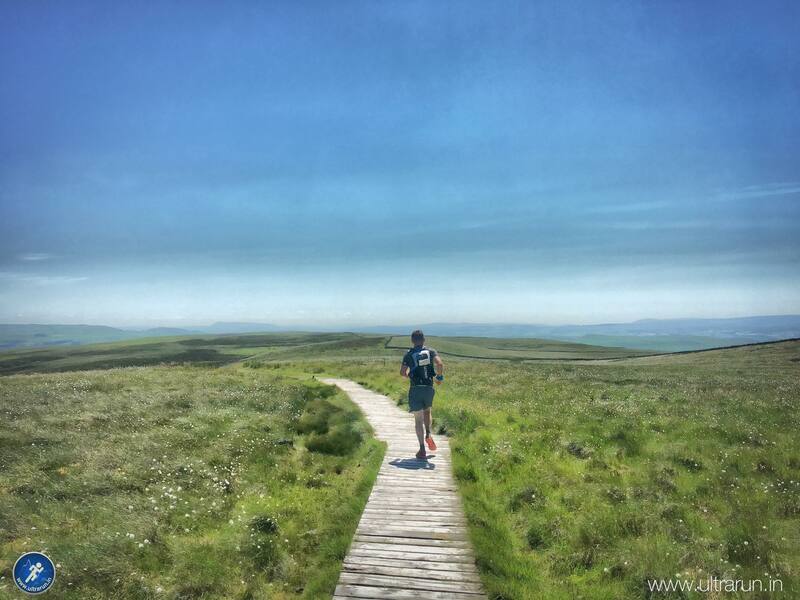 As we ran along the descent towards the river the heat finally became too much for me and just like Andy on the slopes of Pen-y-Ghent, I could feel my core temperature and heart rate rising. As we hit the riverbank my head had started to throb and I was also feeling a little nauseous. Despite the finish being just a couple of kilometres away, I knew I needed to do something or it was all going to fall apart. At a low point in the riverbank I saw my opportunity and dived down to the waters edge and threw handfuls of water over my head and neck to try and cool myself down. After a few minutes this seemed to have done the trick and I rejoined the path and walked on for a few hundred metres cleaning my glasses. Andy had kindly waited and we ran on through the trees but the heat had sucked the life out of my legs and I was still finding it hard work to keep my core temperature down. The village of Malham appeared in the distance and as we ran through a meadow we were surprised to find Andy’s partner Rachel and her mother walking towards us. We exchanged greetings as we ran past, joking how hot it was and that they would find me laying in the river at the finish. Out in the sun I could feel the nauseousness returning. There was only a short way to go but I had visions of me crossing the finish line and throwing up, not the best look for the photos. I apologised to Andy and said I was going to have to walk for a few hundred metres to try and get my temperature under control before running into the village. I urged him on so as not to hold him up but he graciously said he would walk and finish with me. As we entered the final field before the village I said, “right let’s do this” and we set off at an easy run. Through the field we went, with spectators holding the gates open and applauding us as we passed, which was nice. A foot bridge on our left offered us a chance to cross the river, bringing us out immediately opposite the finish gantry. Race staff, spectators and other competitors cheered us in as Andy and I ran under the finish together in joint 13th place, stopping the clock at 11:15. We had done it! Not the 11:10 we had predicted back at Malham Tarn but well under the 12 hours we had hoped for and smashing the 13 hours I had set in my pre-race objectives. Handshakes were exchanged and we were presented with our huge medals, one of the best race medals I have ever received. Water was available which we both took and then there was only one thing for it but to get into the river! Rachel and her mum eventually found us there ten minutes later, medals around our necks and feeling pretty pleased with ourselves I have to say. Ice creams were purchased and consumed and then it was back to the car to tidy up and get a celebratory beer. Richard Martin had arrived back at the finish, as had Race Director Wayne, so we stood chatting for a while before heading into the pub’s beer garden to celebrate. To say we were over the moon with the result would be an understatement. Yes it wasn’t exactly the perfect race execution, with my legs suffering more than normal and the heat taking its toll on us both at various stages. Despite it all though we had still managed to get around in a reasonable time. 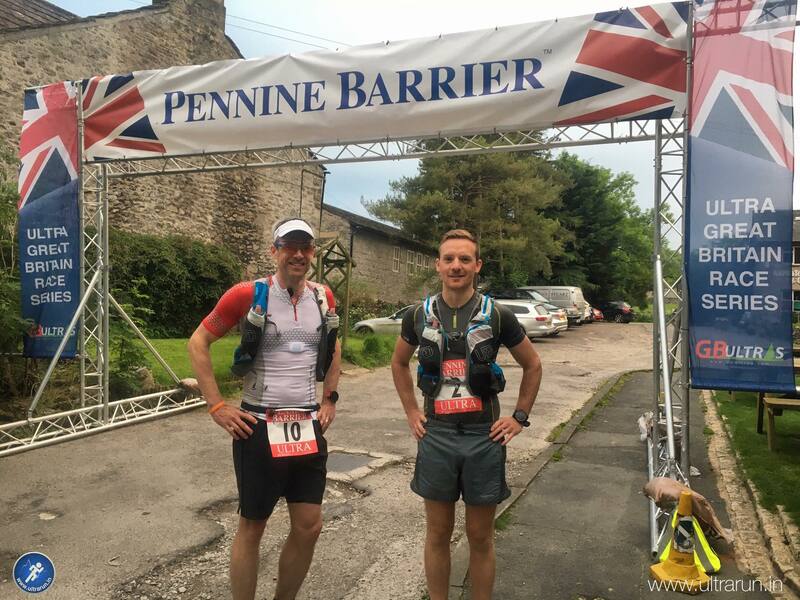 We had both made a conscious choice not to take poles with us for this race, something which we will have at Lakeland 100, as they had proved to be a massive help last year. While my legs struggled more than usual, this was just the hill workout I needed before Lakeland and my legs will only get stronger as a result. Hopefully I will reap the benefits in Coniston at the end of July. So there we have it another Ultra in the bag. I had high hopes for this race and it well and truly delivered. 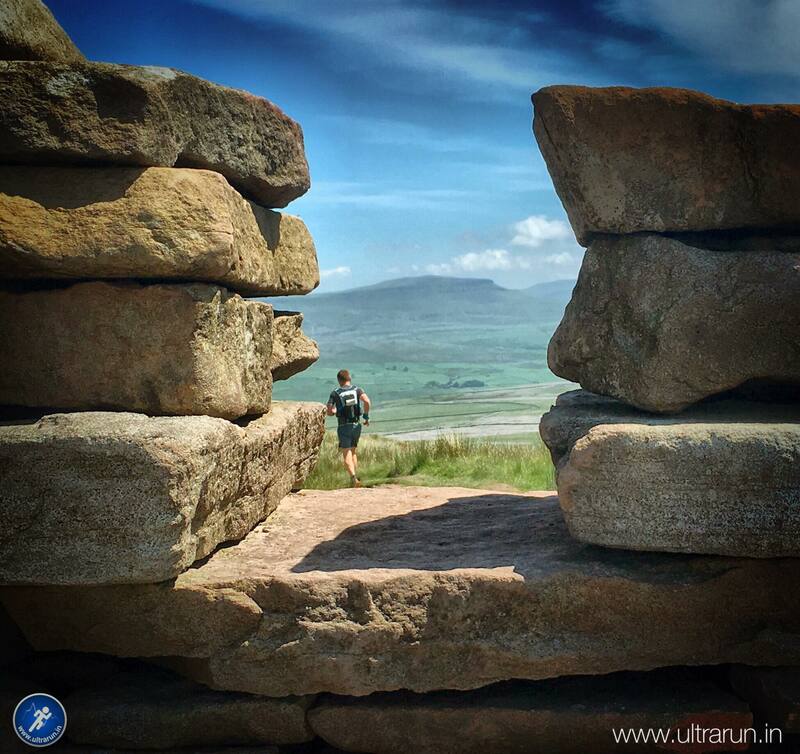 Wayne and the entire team at GB Ultras know how to put on a great event and this shone through, with enthusiastic support all around the course. Massive thanks to all involved in putting this event on, your support is greatly appreciated. The route itself was fabulous, taking in some of Yorkshire’s finest scenery. The roadbook provided gave detailed notes and for those not familiar with the route this should be sufficient to get you around the course. A special mention must go to Chris Campbell, Richard Whitaker and Stephen Duckett, who once they returned to Malham promptly headed back out for a second lap and were the only finishers of the hundred mile event. Hats off to you gents, an amazing effort! Finally huge thanks of course to Andy Haworth for being my partner in crime in yet another race and also to him and Rachel for kindly providing me with accommodation before and after the event, greatly appreciated guys. One litre of water while fine for the majority of the race was no way near enough for the longer leg 3. I need to remember to check distances between checkpoints more thoroughly in future and carry an extra bottle or two if I think I will need it or weather conditions dictate it. While I worried about whether I had carried enough nutrition with me, in reality it actually worked out ok and I was able to get around using Mountain Fuel, two bars (one Nakd bar was still there at the finish), a pack of Shotbloks and whatever I ate at or carried out of the checkpoints. That said poor fuelling may have contributed to the muscle fatigue in my quad, so I will aim to carry a little more at Lakeland as a result. My feet were great with no ill effects at the end of the race, so the pre-race lube and tape worked well. The Inov-8 Race Ultras were also comfortable, so looks like I have settled on the combination I will use at Lakeland 100. Heat was the real killer and in addition to more water, I should have had a buff more readily to hand to soak in water and place on my neck to try and cool me down. I need to ensure I hold back a little more on the early descents. 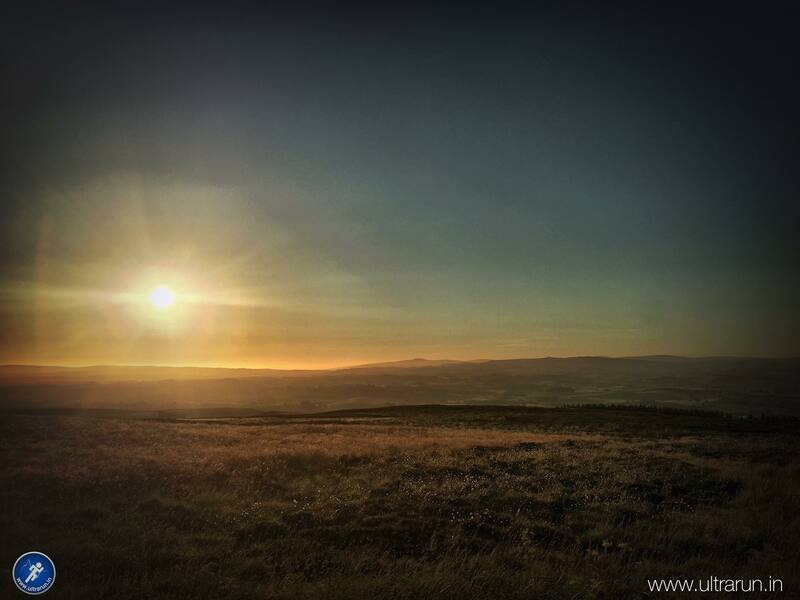 While it was enormous fun running off Fountains Fell and Pen-y-Ghent, my left quad and my legs in general definitely paid the price in the later stages, putting a sub-eleven hour finish well out of reach. And there we have it, another race to add to the list and one that I would highly recommend for the future. All that is left now is to recover and get ready for Lakeland 100. Coniston here we come!